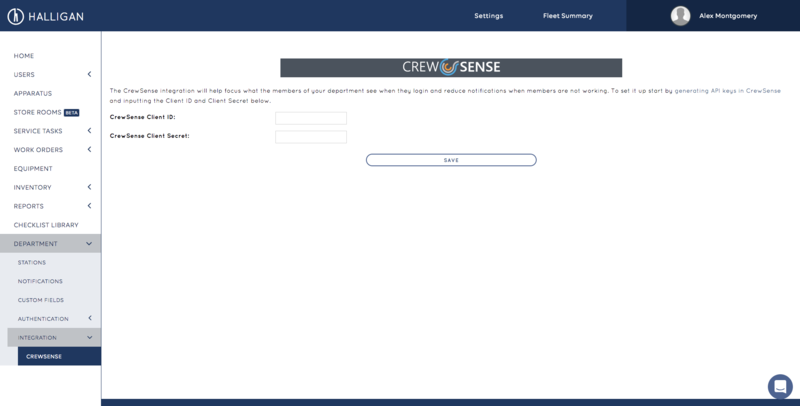 If you don't want your members to get emails when they are not working, or if you want your users to be automatically placed in the correct station the CrewSense integration can help. You must setup 'Units' to leverage the integration. There are two behaviors the integration offers. You can enable and disable these behaviors for each role in your department. Set Station: This will tell Halligan to read the CrewSense Schedule and place users into the station they are working that day. Disable Off-Shift Notifications: If a user can be mapped to CrewSense then the system will not send any notifications triggered by events happening when those users are off shift. NOTE: Users will not get those notifications when they come back on shift. Users are matched by email address. In order for the integration to work users must use the same email in both CrewSense and Halligan. Start by generating a CrewSense Client ID and CrewSense Client Secret inside of CrewSense. You can follow these instructions to get those. Once you have them place them inside the CrewSense Client ID and CrewSense Client Secret fields and click save. NOTE: Don't forget to enable the integration after configuring everything! You might want a core set of leadership to always get emails, even when off shift - but other members to only get email when working. You can toggle those settings on and off. In order to assign stations we have to know which CrewSense Assignment correlates to the Halligan Unit. We map to Units so if an apparatus goes into reserve we still will place the user into the correct station. In the table (pictured below), the CrewSense Assignments are on the left and the Halligan Units are in the dropdown. NOTE: A Halligan Unit can only be mapped to one CrewSense assignment. If a Unit does not appear to save it is because it is already mapped to another CrewSense assignment.